Listed as part of the Historic Courthouse District, in the National Register of Historic Places, this 1840 era Dog Trot Style Log Cabin was discovered by James Voland, of Nashville, while rabbit hunting in Jackson County. The Cabin was moved to Brown County in 1935 and rebuilt as part of the WPA Projects. It was the location of the Brown County Community Club, and served the town and county as the site for many large civic gatherings and events. 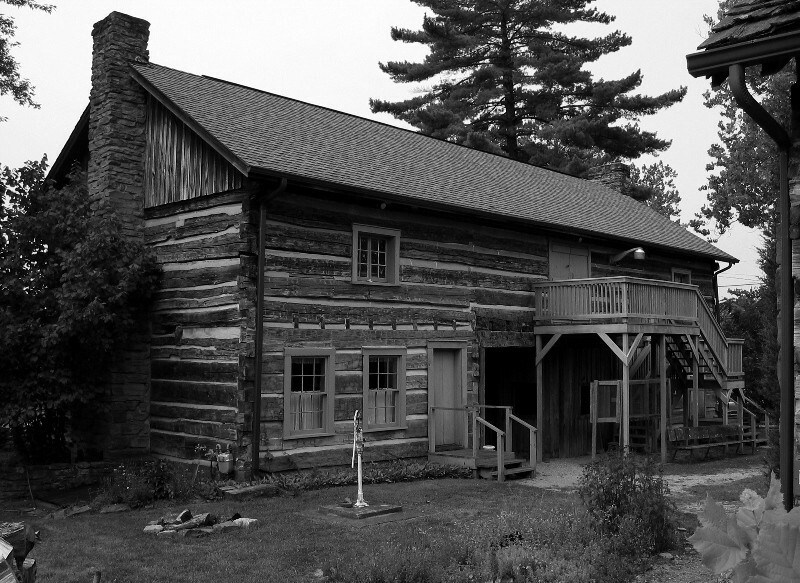 In 1972, this cabin and the 'Old Log Jail' became the cornerstones for the Brown County Pioneer Village, operated by the Brown County Historical Society. Usually staffed by members of the Pioneer Women's Club, the Loom Room captures a glimpse of what it was like to spin and weave homespun fabric in the late 1800's. A New Feature this year, includes a working display of old hand tools and woodworking items used by pioneer settlers to make their own furniture, and build log cabins. At the top of the center opening in the Community Building Log Cabin, you will be able to see logs in excess of 60 feet. The story goes that they were strapped to the outsides of two trucks, and carefully moved to this site in 1935.